Whether you’re going back to school or you just want to get a jumpstart on your fall wardrobe, plaid is a solid styling choice! It’s always in style for fall and winter so you can’t go wrong with investing in one or two (or several) timeless staples for your cold-weather closet! If you haven’t guessed yet, this blog post is going to walk you through how I would style a few of my favorite plaid pieces we’ve got in our current inventory and I’ve split it into three sections – plaid tops, plaid skirts, and plaid dresses! First on the list: the humble plaid shirt. These guys come in all sorts of colors, styles, and varying degrees of personality. One of my favorite things about vintage clothing is the personality each piece carries. 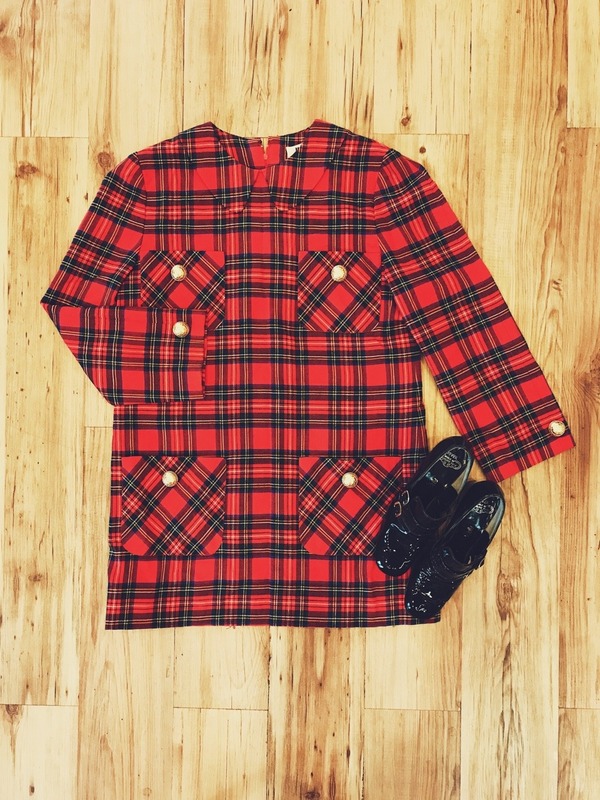 At Vintage Tex, we like to stock the most unique items we can find that have real flair to them over less detailed, more basic items – the quirkiness of this particular plaid shirt comes from its high ruffled collar! It’s right on trend with its Victorian vibes and ruffles alongside the buttons but maintains a sense of timelessness because of its classic pattern. 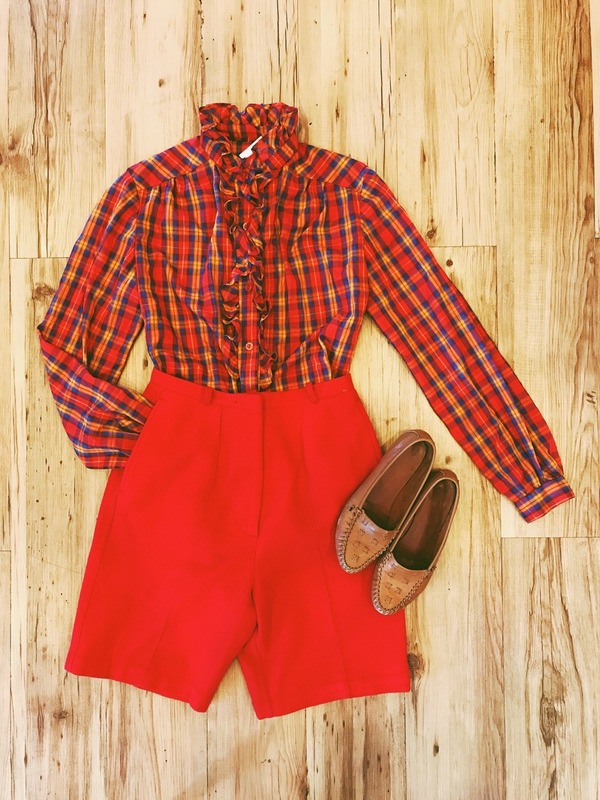 I’ve kept the rest of the outfit simple by going for a super high-waisted 1960s red wool short on bottom and finishing off the transitional almost-fall ensemble with a simple pair of 1970s brown leather flats. Comfortable, too – perfect for walking back and forth across campus! Next, I chose another plaid shirt with just a little extra *something* – this one has a fun western twist! 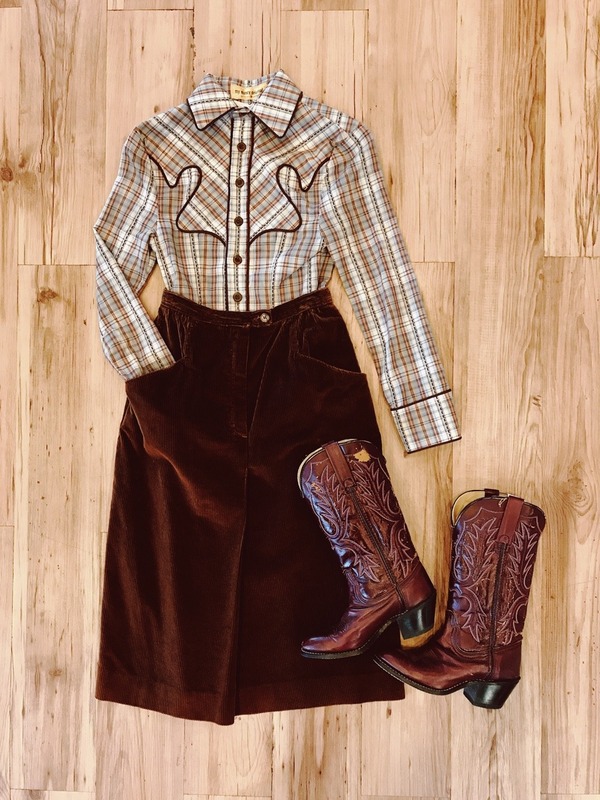 I’ve played up the ’70s “cool cowgirl” vibes with a nice and sturdy mid-length corduroy skirt in brown and a pair of gorgeous, dark cherry red leather Durango western boots. Both the boots and skirt are great mix-and-match pieces making them great additions to any student’s wardrobe because they’re perfect to pair with just about anything! Moving forward into skirts, I’ve style another two looks for you! 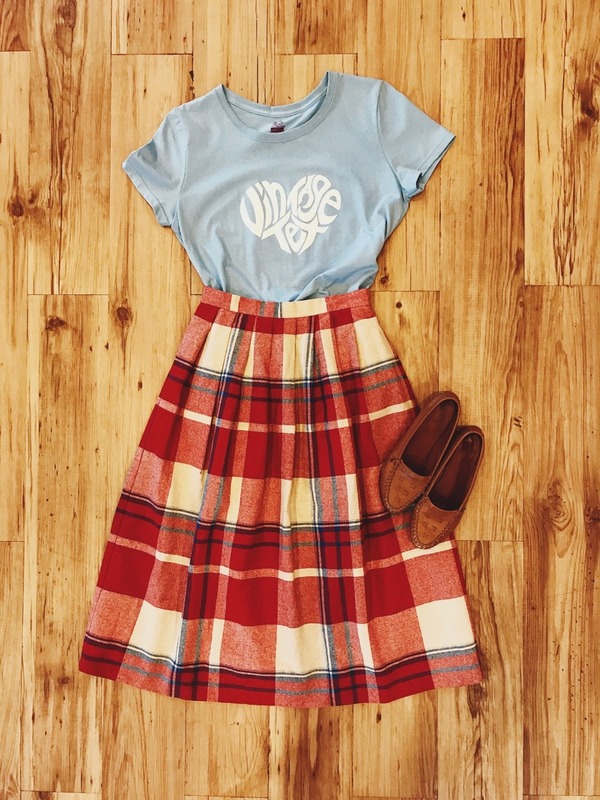 Now, plaid skirts SCREAM “school uniform” but there are so many more ways to style them than with a button-down, knee-high socks, and saddle shoes! First, I’ve kept the classic schoolgirl silhouette but this particular plaid is a bit different to the usual as its more of a grid print which gives it a very cool, modern twist despite being from the 1950s – further proof that fashion is cyclical and what once was trendy will be trendy again (so save your clothes and call us in 50 years when all the kids are wearing ’em again!) I’ve tucked in a classic black 1950s cardigan in the softest cashmere, perfect for fall breezes or chilly classrooms, and I decided to keep the accessories very classic and simple as well. 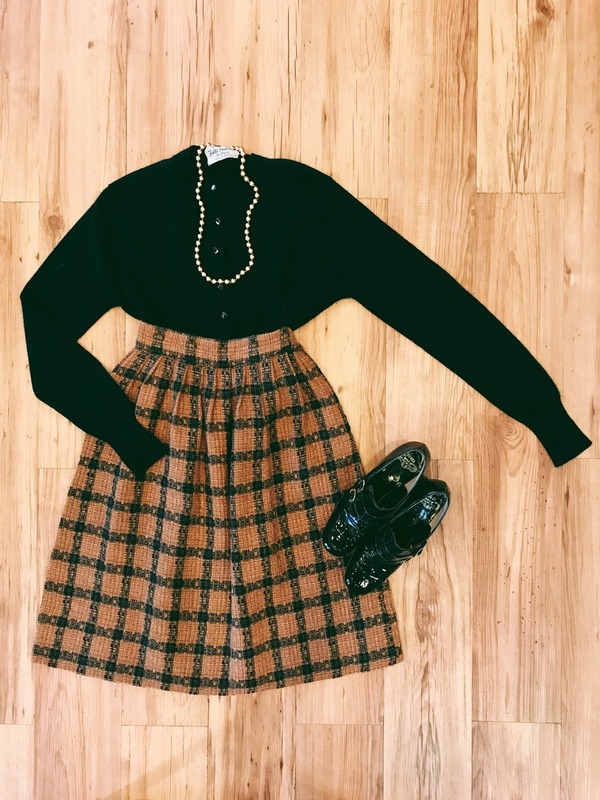 A strand of bronze-toned faux pearls accentuates the neckline perfectly and brings in the tan shade of our lovely wool skirt, and a pair of shiny black patent leather shoes with sturdy block heels and gold buckles finish off this quintessential ’50s-’60s back-to-school ensemble. My next plaid skirt styling tip is to pair one with a graphic t-shirt for casual yet super sassy vibes. Graphic t-shirts or “slogan tees” are a huge trend that I don’t see leaving us anytime soon so you can find them practically anywhere but you can only find this cute little Vintage Tex heart logo t-shirt here at our store, and what better way to show your love for the coolest vintage store around than by wearing our merch?! I accented the blue running throughout this 1970s mid-length plaid skirt with one of our blue logo tees and brought back the oh-so-versatile 1970s brown leather flat loafers from before to complete our super cute and casual look! And now, we’ve made it to the final outfit! I said it was a little funkier, but in color rather than shape. 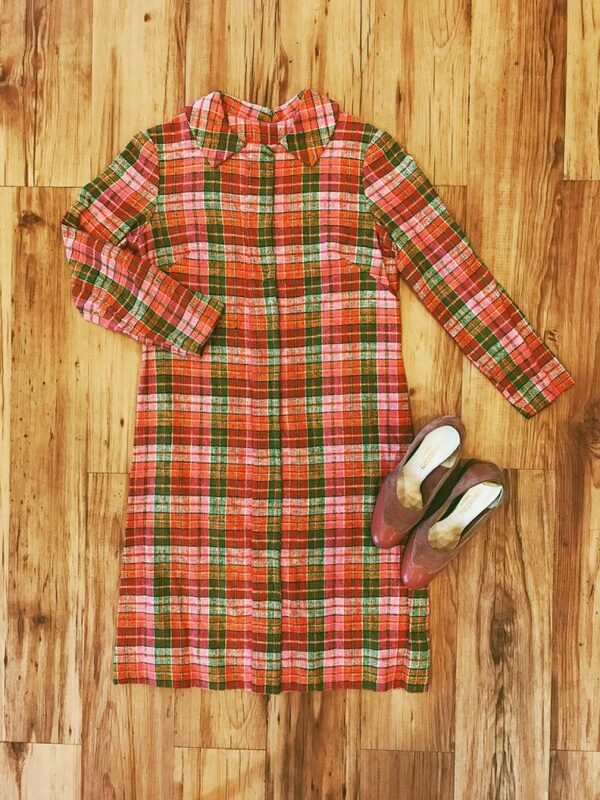 You can see that it’s a simple straight shift dress with long sleeves and a collar – a classic silhouette that flatters so many different body shapes – but it’s in a fun and unique pink, orange, and green colorway. I let the bold colors speak for themselves and simply finished off the look with a pair of 1970s blush pink leather and suede wedges to play with the pink tones in the plaid material of the dress and left it at that. This one combines summer colors with a fall pattern making it a perfect transitional piece to get you from this season to the next. There’s the six ways I’ve styled six different plaid pieces for fall. I hope this has inspired you to try wearing this classic pattern in a new way this season! For more styling inspiration make sure to follow us on Instagram and Facebook, and I’ll be back here with another post for you soon!